Thirty years after his rejection from the promi­nent Art Academy in Vienna, Adolf Hitler stood on the balcony overlooking cheering crowds at Vienna’s Heldenplatz and declared, “As lea­der and chancellor of the German nation and Reich, I announce to German history now the entry of my homeland into the German Reich.” Just eight months later during the November pogroms, 6547 Jews in Vienna were arrested, thousands of Jewish-owned shops plundered, and 42 synagogues and houses of prayer were set aflame. As Hitler’s master plan progressed, the arrests and atrocities against his decla­red enemies of state (Jewish citizens, social democrats, gays and lesbians, Roma and Sinti, communists, Jehovah Witnesses, and those considered socially deviant) escalated, and those who could not escape were sent off to concentration camps. At the same time, the Allied Forces fighting Hitler were drawing up the blueprints for a post-war Europe. At a meeting in Moscow in 1943, they determined that Austria should be re-established as an independent state and that Austria was the “first victim of Hitlerite aggression.” Whether or not the Austrians of that time were victims or perpetrators is a question that still continues to haunt the city to this day. 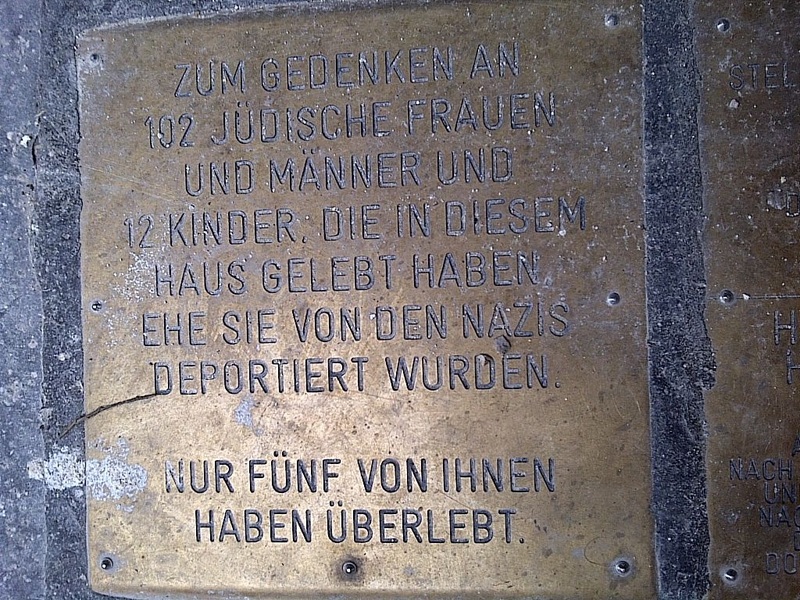 Sign in sidewalk in Vienna, in memory of Holocaust victims who once resided there. Throughout the city you can still find evidence of both—from brass plaques detailing the names and dire fates of residents who lived in apartments taken over by the Nazis to the “O5” symbol inscribed on the wall of St. Stephan’s Cathedral, showing the mark of the Austrian resistance movement. At Judenplatz in Vien­na’s first district, you will find a Holocaust Me­morial for the 65,000 Austrian Jews who were murdered during WWII, and at Morzinplatz, a memorial dedicated to the opponents to the Nazi regime who were tortured and killed at the Hotel Metropol that once stood there and served as the headquarters of the Gestapo.